We are a heart-centered and community-driven space dedicated to connection, inclusion and quality. We believe in meaningful work for people of all ability levels and backgrounds. We brew coffee with integrity and bake all of our goodies in-house, prioritizing local, organic, non-GMO and sustainably grown ingredients. We invite you to learn more about Soltane Cafe and look forward to connecting with you more! Thank you for subscribing! We’ll be in touch soon! Find us on Bridge Street in downtown Phoenixville, conveniently located between Iron Hill Brewery and The Great American Pub. We have a lovely outdoor garden and sidewalk café tables for seating in nice weather, and a welcoming space indoors for gathering with friends or enjoying the pleasure of your own company. We offer free WiFi to all customers. Steamed local milk, an expert pour of Counter Culture espresso, and just the right amount of spice and sweet. Cortado (from the Spanish cortar) is an espresso cut with a small amount of warm milk to reduce the acidity. We start with freshly ground Counter Culture coffee, hand pouring water through the grounds to extract the coffee flavors into your cup without the bitterness. Try our chocolate, almond, and traditional croissants for a taste of Europe without having to cross the sea. Baked weekly in our cozy kitchen, including delicious seasonal veggies and local cheeses to delight any quiche connoisseur. We've been baking up delicate ginger cream scones since we opened our doors. 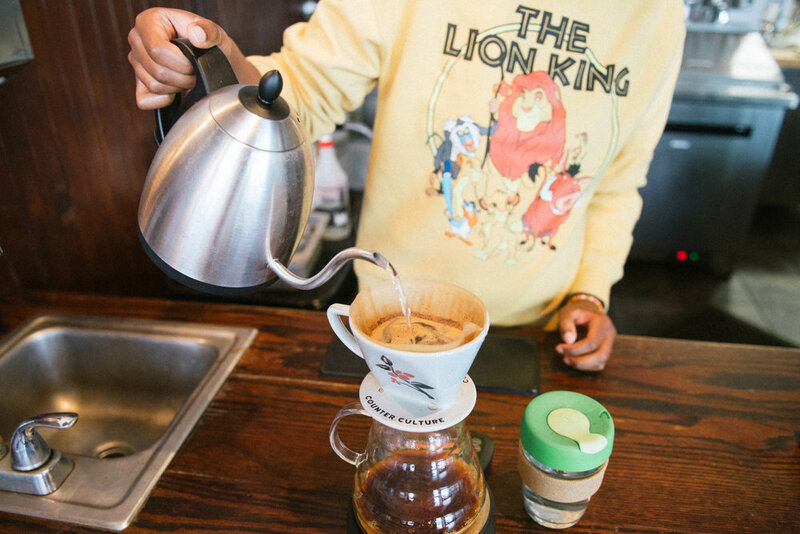 The perfect compliment to a steaming pourover or a pretty cortado. Keep in touch! We update social media daily with special offerings, new coffees, & pastries de jour. Soltane Café is an enterprise within the larger organization Camphill Soltane. Camphill Soltane was founded in Chester County in 1988 with the mission of creating more choices and opportunities for young adults with intellectual disabilities and autism. Some values that have always been core to Camphill Soltane include: providing care and consideration to all people, regardless of background or ability; creating community contexts where natural relationships can grow and thrive; and encouraging creative exploration for all who engage our communities. Through the Soltane Café, Camphill Soltane hopes to bring these values to the larger community. Learn more about Camphill Soltane! "Great little place for coffee and a pastry. After the first visit the staff already remembered my name and preferred drink! Everything here is made with care and quality ingredients. Lattes, mochas, pour over coffees...you really can't go wrong whatever you order. The best part, however, isn't the coffee but the community. Phoenixville really loves this place. Tons of repeat customers give it a familial atmosphere. Come visit!" "This cafe serves excellent coffee, incredible pastries, and is an enterprise of the non-profit Camphill Soltane, an inclusive community offering people of varying abilities to share in meaningful work and life together. The staff are creative, good-hearted people who embody the values of excellence and inclusion. This spot is in the heart of Phoenixville and in many ways contributes to the heart of Phoenixville!" "There's a lot of cute cafés, and there's a lot of nice bakeries out there. What sets Soltane apart from the rest of them is that it warms your heart. It's like an old world café, not through some pretentious décor, but through the sincerity flowing in the air. You might often see groups customers with special needs. That's right. It's part of Camphill Soltane which is a community that helps people with special needs. Their artisan brand and pastries are either made from ingredients from local farm and/or organic. They're different from what you get from anywhere else. Their direct trade coffee and espresso are delicious and fresh. Service is always honest and friendly. They give you 100% personal attention. When I walk out of Soltane, I always feel good for rest of the day, knowing people still care."